Ants commonly enter residences and businesses searching for food and shelter. While they are not particularly harmful, no one wants to find ants feasting in cereal boxes or crawling around in the sugar dish. 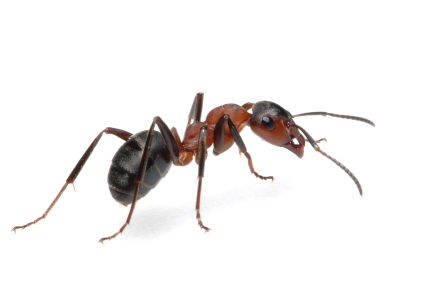 Titan Termite & Pest Control offers quality ant control services throughout South Carolina including the areas surrounding Anderson, Greenville, Columbia, and Charleston. Due to their minuscule size, ants are able to gain access to a structure through even the tiniest of holes and cracks. Caulk and weather stripping can be used to seal these areas in order to prevent entry. Ants have an affinity for almost any type of food, so keeping food containers tightly sealed and thoroughly cleaning up spills as soon as they occur can help to discourage these pests. Many varieties of pesticides and baits are available to the general public and may aid in abating the infestation; however, not all brands and types are effective for all species of ants. Understanding which method to use could be difficult since it may be impossible to know which species of ant you are dealing with. Another issue would be the ants' nest. Upon invasion, ants produce a pheromone trail leading from food sources to their nest. If only the ants seen inside the home or business are being dealt with, others in the colony can easily sniff out the trail and follow suit. Nests can be next to impossible to find as they can be built anywhere from in a basement to a dead tree stump in a nearby wooded area. The nest and all of its inhabitants must be destroyed before the problem is completely annihilated. Trying to rid yourself of an ant infestation using traditional methods could be a lengthy and, ultimately, a costly endeavor. Professional pest control services have the training and knowledge needed to quickly and effectively eliminate the problem, from the lowliest worker ants to the nest and the queen therein. Pest control specialists are educated on which types of pesticides to use for each individual species. They are experienced in finding even the hidden culprits and stopping them at their source. Contacting a professional pest control service can liberate victims of ant infestations from a great deal of unnecessary expense and frustration.